Army Sports Club held CR & FC to a thrilling 24 all draw. in their Dialog ‘A’ Division inter club league rugby tournament first round match played at Air Force grounds Ratmalana yesterday. CR’s 24 points came through ( 4 tries, 2 conversions) while Army’s 24 points came through (3 tries, 3 conversions, 1 penalty) The Soldiers led 14 points to 12 at half time. For the CR & FC team the four tries were scored by number eight Omalka Gunaratne (one), scrum half Harith Bandara (one), flanker Wajid Fawmy (one) and prop forward Dulanjana Wijesinghe (one) while the two conversions were fired across by fly half Tharinda Ratwatte . 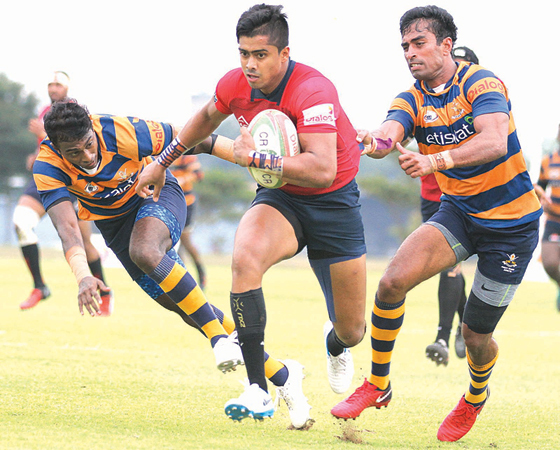 For the Army Sports Club the three tries were scored by prop forward Asoka Jayalal (two) and winger Sudaraka Dikkumbura (one) while full back Gayan Salinda put over the three conversions and the solitary penalty. Referee Ishanka Abeykoon had a good game with the whistle.